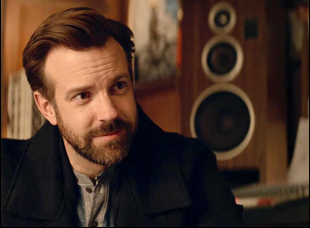 True to the collaboration that followed on the new comedy “Tumbledown,” the relationship between composer Daniel Hart and director Sean Mewshaw started off on a harmonious note that may seem a little unusual on the surface. Musically, Hart is fluent in a number of languages, his “weirdness” easily reclassified as being distinctive in his choices, whether it was the handclaps that punctuated David Lowery’s crime drama “Ain’t Them Bodies Saints” or the trembling violins that underlined the chills in Jennifer Harlow’s haunted house flick “The Sideways Light.” Still, ”Tumbledown” is a little different for the composer, who supplies a score in which the term “pluck” could be used‎ as either a verb or an adjective, given how lively it is, full of mirth and mischief. In order to tell the story of a woman (Rebecca Hall) fending‎ off the advances of a pop culture professor (Jason Sudeikis) looking into the death of her husband Hunter, a musician who left behind just a single iconic album, Hart tugs at the heartstrings as if they were additional chords on his instruments, both in conveying the bone-deep heartache that Hall’s Hannah continues to recover from as well as the tingly sensation of feeling something new as she starts to warm to Sudeikis’ Andrew. The music supervisor Gary Calamar reached out to me in the summer of . They were in post-production and he asked if I was interested in working on it because he had some conversations with the director Sean Mewshaw and Sean had expressed interest in working with me. I’ve actually done three romantic comedies now, but this was when I was just getting my bearings in that world, so it took a while to get the pacing right, but Sean and I really saw eye to eye on a lot of things – just like life things – so it made it easy. He was very clear about what he wanted and he had enough of a musical background to be able to communicate that to me. Did you actually work with Damien Jurado, who wrote and performs the songs of Hunter, the deceased musician in the film? I did have interactions with Damien, but mainly just in the beginning. Damien had already been working on it a little while and I think he was having a difficult time understanding exactly what it was that Sean wanted from him, so Sean encouraged me to talk to him and give him my perspective from that world since he hadn’t done any film stuff previous to “Tumbledown.” We had a couple conversations at the beginning of the process and I just told him about my experience [scoring], but then I also got to tell him how much I really loved his music. Before I became primarily a film composer, I was mostly a touring musician and a lot of the bands I toured with had relationships with Damien, so we knew a lot of the same people going into this, but had never met each other, so I was really thankful for that opportunity. Did your music actually reflect off his in anyway? When we started out working on it, Sean and I agreed that it would be best if the score was a separate thing. If Damien’s work represented the missing protagonist from the story, the score [shouldn’t] try too hard to use the same style or instrumentation, so the songs stood out on their own. But once I got going, it became clear that it would actually work better if the score did bounce more off of Damien’s songs and did actually reflect some of the same feel so it wasn’t exactly the same thing, but there was a transition between this one very musical aspect of the film in Damien’s songs and the undercurrent of everything that happens [with the score]. Were there any specific instruments that came to mind while working on this? Because Sean had really liked the score from “Ain’t Them Bodies Saints,” we started with that instrumentation as a template for this – a lot of violins, a lot of banjo, mandolin, acoustic guitar and atmospheric, buzzy, drone-y sounds. But the things that caught me off-guard was the cello pizzicato – the plucking of the cello in several of the scenes — that just made it feel a little funnier. It felt much more lighthearted in that way. I was also very wary of doing any vocal stuff [in the score] because the film was already so song-heavy, but there was just a scene that I was working on and I couldn’t find an instrument that could express what I was trying to express musically, so I tried singing a melody line over what I had already done. I turned it into Sean with a bit of apprehension, but he really loved it, so I started looking for a few more places to incorporate a far-off-in-the-distance, ghostly, haunting vocal melody. Do you take a lot of inspiration from the characters in writing the score? Yeah, that’s one of the main places I take inspiration. There are scenes in the film where Rebecca Hall’s character plays the piano and some of that is actually her playing. There are other scenes where they wanted something that would approximate her playing, so I had to take that into account and consider who the character was, their level of competency on the piano and if they would play something like this. Like if the character in the film took piano lessons as a kid, but doesn’t play professionally, I can’t do a Rachmaninoff concerto – not that I even could – but that’s one of my main points of connection on any film is through the characters and through their motivation. If it’s a well-written script, the protagonists and antagonists all have very clear motivations – something they really want and they’re going after it — and for me to know what that is helps me decide what kind of music fits their personality. In general, was it much of an adjustment to write film music as opposed to songs you might perform yourself? It really helps me to have been playing in bands for so long and to have within that context, the opportunity to learn a lot of different instruments and play in several different styles. I used all of that and have been able to spread my wings in terms of musical styles on the films I’ve worked on. I’ve done dramas, romantic comedies, thrillers, documentaries and I feel lucky I haven’t been limited to a specific style or genre so far. But when I’m going from working on band stuff to film stuff now, it does feel very different to me -like one set of tools and vocabulary versus another, especially because if I’m working on songwriting, I’m the one trying to express something aesthetically, but if I’m working on a film, it’s always the director’s vision and it’s my job to help them tell that story as best I can through the music. I have to think about what it is that they want and what they’re trying to communicate versus what it is that I want. How did you get into film composing? I know you broke in with the first films of David Lowery. Yeah, it was because of David. He had seen one of my old bands play a show because we had a mutual friend and he asked me to write some music for his first feature, “St. Nick.” There was no budget — he filmed it all himself — so he just asked me to write a little bit of music. I had watched some of the film and wrote a couple pieces based more on feeling more than anything else – the music didn’t fit the scene, but he really liked them and he put them in the film. Then the next year, he was working on a short film “Pioneer” and he asked if I’d actually score it, so we got together, we talked about the music and then I wrote and recorded all that music over a couple weeks. That was fairly well-received at Sundance and SXSW, which I think allowed David to get “Ain’t Them Bodies Saints” made, and at the time of “Saints,” I think the people producing the film had some ideas about composers they wanted to use, but he was very insistent that he be able to hire me, so I really owe it to David Lowery right from the beginning and all the way through, continuing to want me to work on his films. It’s the reason I’ve been able to work at all. Has it been interesting to branch out in recent years? Yeah, it has. The first film that I scored after “Ain’t Them Bodies Saints” was a little ghost story drama and the director Jen [Harlow] was a friend of David’s, so that came through David, but everything that I’ve done since then came from other places, so for the most part, I’ve been working with people I’ve never met. The first one of those that I did was rough. I had been spoiled by working with people with whom I had a very similar aesthetic and then the next film I did was a style I had never done and a director I had never met, so it took a long time to get adjusted to that. I’m really happy with the way it ended up, but it didn’t come easy. After that, it’s probably a combination of me learning how to work with people that I may not see eye to eye with and just getting lucky with the people I’ve worked with. There may have been a few revisions along the way, but for the most part, it really felt like a collaboration between the directors and I on all the films I’ve done. It just felt right. 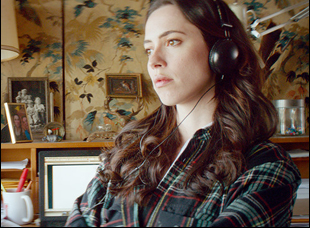 “Tumbledown” opens on February 5th in Los Angeles at the Sundance Sunset Cinemas and New York at the Village East Cinemas. It will be available on demand on February 12th. Sundance '16 Review: The Dark Side of the Power of Belief is Brought to Light in "Holy Hell"
Interview: Grímur Hákonarson on Leading the Pack with "Rams"